Back in 1974 when Solid State Micro Technology first launched their range of analog electronics on a single microchip, it launched a whole new wave of affordable (to some!) synthesizer designs. Their products along with the Curtis chips provided the circuits for many classic synthesizers. This week, Sound Semiconductor announced their first product, the SSI2144 - a Four Pole Voltage Controlled Filter, which is an improved re-issue of the classic SSM2044 thought by many to be the "best sound filter chip ever produced". 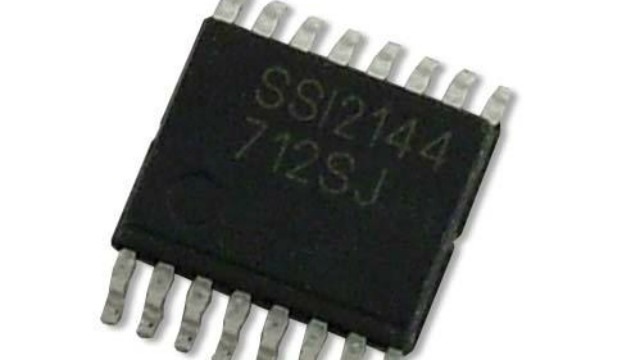 The SSI2144 was developed by Dave Rossum who originally designed the SSM2044 but with improvements: lower noise , better performance and pin outs optimised for PCB layout. Available now in sample quantities for designers to work the new chip into upcoming designs, the SSI2144 will be available in production quantities by late Spring 2018. $1.60 each at 1000 pieces. Though Sound Semiconductor will be offering smaller quantities to enthusiasts through resellers. Presumably as when the original chip was launched, we may now see a new slew of products taking advantage of this new (old) technology in affordable instruments and products. Initial samples available late Summer 2017. UPDATE - it appears that the SSI2144 is electronically compatible with the original SSM, but the pins spacings are different. However we're told that it can be used in older synths if you need a replacement part with an adapter.